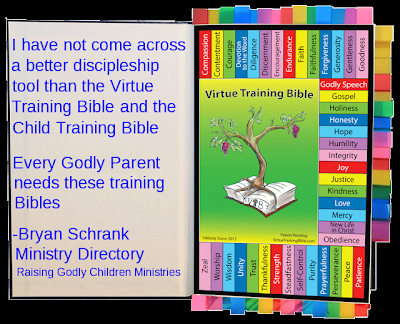 How many Godly parents discipline and instruct their children straight from the Bible? I mean, literally open up the Bible and read them scripture? Not many. Why? It would take a lot of work to look up all those verses and a lot of scripture memorization too! Yet, we are commanded in the Word to “bring them up in the discipline and instruction of the Lord.” (Ephesians 6:4). What is a Godly parent to do? 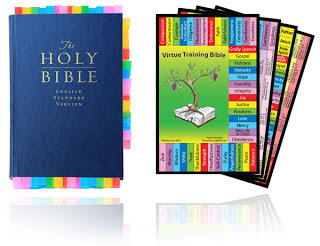 Mindy Dunn, inventor of the Child Training Bible, has created another invaluable tool for parents. 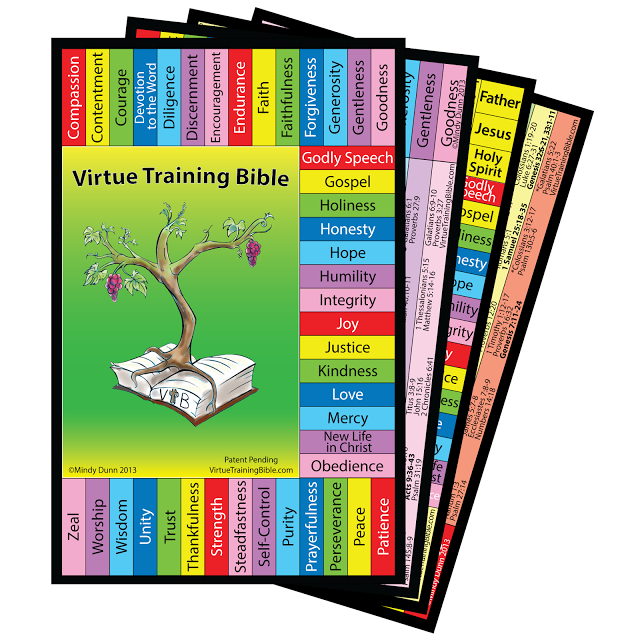 The Virtue Training Bible (VTB). The VTB was designed as a quick resource to look up certain virtues to disciple and discipline your children with. Some of these virtues include (over 40): Compassion, Courage, Justice, Mercy, New Life in Christ, Trust, Unity, and many more. These virtues can quickly accessed through the ready to use tabs. Not only are specific virtues discussed, but the GOSPEL is also presented. This is an extremely effective evangelistic and Christlike-character building tool for your child. Here’s a scenario, say your child is struggling with being Thankful: You would locate the Thanksgiving tab and be able to quickly look up the scripture references relating to Thankfulness, and discuss them with your child. This process is FAST and SIMPLE. Not only is this used for personal instruction, it can also be utilized during family or individual devotions. In addition to the kit you will need to buy tabs from an office supply store and matching colored highlighters. For more information on how to put together this kit you can view the video HERE. I would recommend using a hard cover Bible. The Bible has to be 9×6 in size. This is the Bible we used. I would like to thank Mindy Dunn for sending me this wonderful product to review! Great idea! Very inspiring and colorful (which is what my kids are attracted to)! May God bless you as you bless so many familes espcially children on this wonderful idea! Thank you so much! We have so many children bibles but I notice I mever pull out my bible or daddys bible to read scripture. Thishas inspired me to share this idea with my husband on possibly having a family bible that we can all go to and specifically use this method only on the family bible while we all have our own personal bibles . Very creative. Good job and thank you! I love this tool!!! 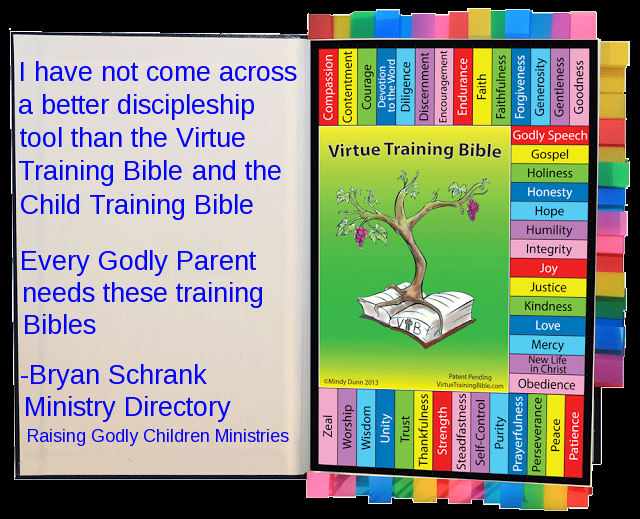 Can you use the Child Training and Virtue Training in the same Bible or do you need 2 separate Bibles to use both of these great tools?